We can finally wave goodbye to winter and look forward to the beautiful trends of spring/summer. Already making an appearance on the celebrity red carpets, it seems effortless, tousled, hair is the way to go this season. Using minimal products and embracing the natural you, these easy to create styles will fit perfectly into even the busiest schedules. Generally the easiest products to apply are leave-in sprays or mousses that you can leave to air-dry naturally. Most of these products contain sea salt to achieve effortless, beachy, waves, and although cosmetically this works amazingly they do not contain any hair nutrition. So how can we get both in one? 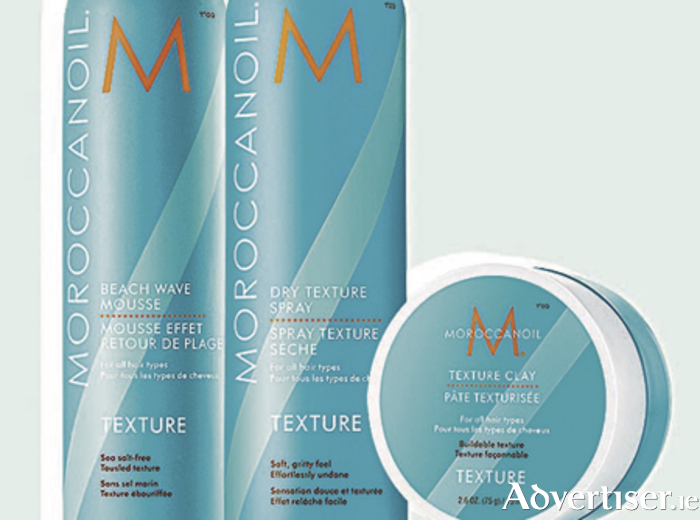 Well it seems Moroccanoil has heard the plea and has responded with a new texture line. Consisting of a beachwave mousse, a texturising clay, and a dry texture spray, these products all contain argan oil and volcanic extracts to both nourish the hair and stay on trend. Volcanic extract of zeolite is used to imitate soft beach waves but also to absorb damaging UV rays, making it the perfect addition to your spring/summer hair regime. Moroccanoil texture products are available in Ritz Hair & Beauty, 16 New Dock Road, Galway, 091 564005.